A creamy, Ecocert certified, waterproof eye pencil that offers professional performance. Soft and smooth application with rich color pay-off guaranteed to help you achieve the desired look, from a precise line to a perfect smudge for smoky eyes. The high content of moisturizing ingredients and natural antioxidants, marula oil, jojoba oil, candelilla and carnauba are excellent for sensitive skin. The pencil comes in three shades – Noir (black), brown and steel 3 (grey). I received the brown. I’m so happy that I didn’t receive a black eyeliner, I have so many of them to use up in my stash. And my only brown eyeliner (Urban Decay) is nearly finished, so it was perfect timing to get a new one! So how is it? 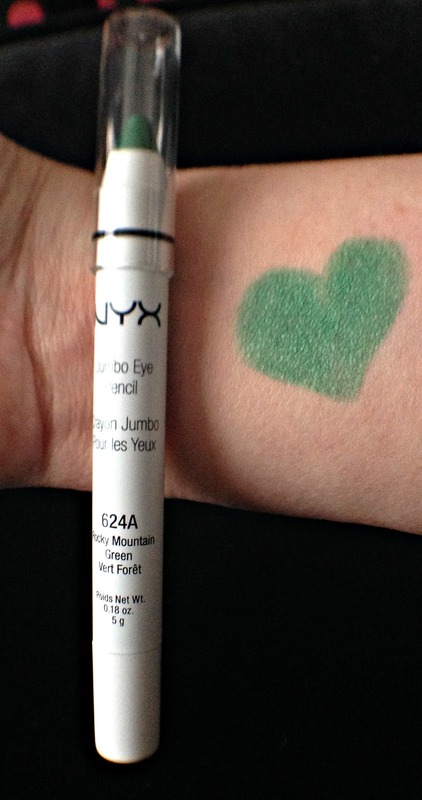 This eyeliner is long wearing and does not budge once applied – it even withstands my watery eyes! I love that it comes with a sharpener – and the sharpener is a good one. For this new season, Sothys holds up a mirror to a beautiful reflection and magnifies your powers of seduction. First up is the Cream Blush ($45 CAD). A cream formula that transforms into a powder for a guaranteed healthy glow. An Old Rose shade that warms up and brightens the complexion beautifully. It has a smooth, easy-to-apply texture that melts onto the skin. This is the first true cream blush that I’ve ever used. The Old Rose / Voile de Rose shade is very wearable, and I can see it working for a wide range of skintones. Because I’m quite fair, I have to apply with a light hand. I apply it with my fingers first, and then blend it out with a synthetic brush. Next is the Smoky Eye Duo which is composed of the Contour Eye Pencil and Smoky Eye Pencil in Plum ($48.50 CAD). A smoky eye pencil and an eye contour pencil in matching shades for a chic, sophisticated look. A jumbo pencil for easy application and perfect coverage. A retractable eye contour pencil with a fine lead for drawing precision strokes. The Smoky Eye pencil applies smoothly, and can be easily blended out with a synthetic brush. I love the metallic plum effect. 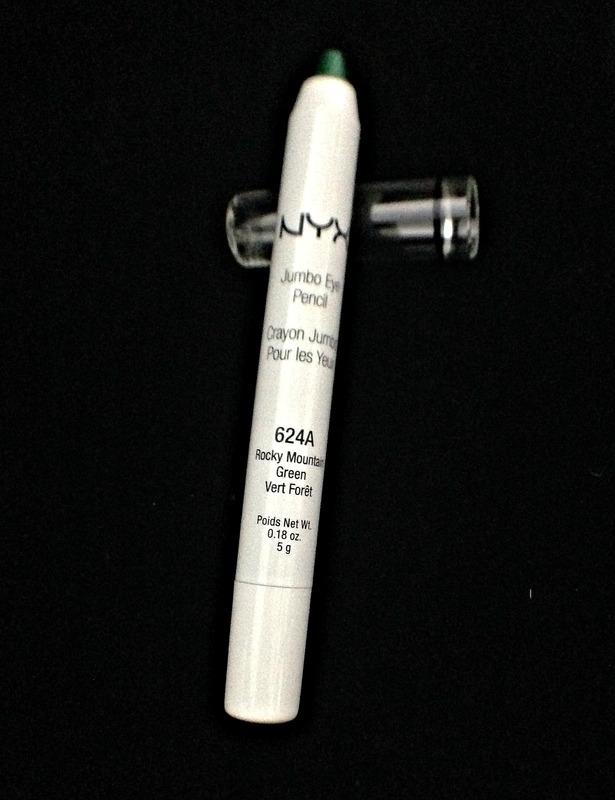 The contour eye pencil can be used for a cat eye, or for lining the bottom lashes for a dramatic smoky eye look. The Velvet Effect Lipstick in Rose Le Pic ($35.95 CAD). This formula offers a comfortable velvet feel added to a matte, second-skin effect. Elegant packaging with red velvet pouch. This lipstick is so beautiful – from the packaging to the embossing on the lipstick. It is a super hydrating, velvety matte finish. The shade Rose Lepic is so perfect for fall! Sothys formulates all its products and treatments without animal testing. Sothys does not believe in this testing method, instead using in vitro and human patch testing to assure its users of its product safety and efficacy. Disclosure: PR samples, however my opinion is entirely my own. Today I’m reviewing the eyeliners that I received at the Generation Beauty event that I attended last month. I received the Duo Stroke liner. It is a nice deep dark black, and has AMAZING staying power – it is waterproof, so this is not going to budge until you remove it! I like that it has two different tips, so you can choose how thick or thin of a line to use. Versatile pencils suitable for both your eyes and brows. Sharp enough to create a defined point but also soft enough to create a smokey, blended effect. Comfortable to apply and easy to sharpen. I do love the colour, but I don’t find it to be soft. The colour smudges easily, and it is not super long wearing on me. This pencil is soft and applies like a dream. It is more of a soft black than an ultra-black colour to me, maybe because I’m used to both Perversion and Zero from Urban Decay which are super dark. As for lasting power, it isn’t as long lasting as UD on me, but I’d still say that the lasting power was decent. What is your fave liquid liner? Fave eyeliner pencil? Disclosure: These products were freebies / gift bag swag from Generation Beauty Toronto event. I am under no obligation to review these products. My opinion is my own. The Body Shop, Deep Sleep Comforting Milk Bath Float – I loved this foaming bath milk. If I didn’t have a stash of bath and body products to use up, I would buy this one again. The original review is here. The Body Shop, Wild Rose Hand Cream – I loved this hand cream, but the metal tube cracked and split open before I was finished using it. Not only did it leak hand cream every time I used it, it was sharp enough to slice open my finger. I won’t repurchase this unless they change to a different packaging. The original review is here. Consonant, Intensive Therapy Organic Hand Cream – Stashy sent this one to me as a part of her Totally Awesome Giveaway. I love, love, loved this hand cream. I will be purchasing a replacement the next time that I make an order from well.ca. The original review is here. CO LAB, sheer invisible dry shampoo in Rio scent – This is my second can of this dry shampoo. It works well and I like the scent. I’ll be picking up a replacement this afternoon. 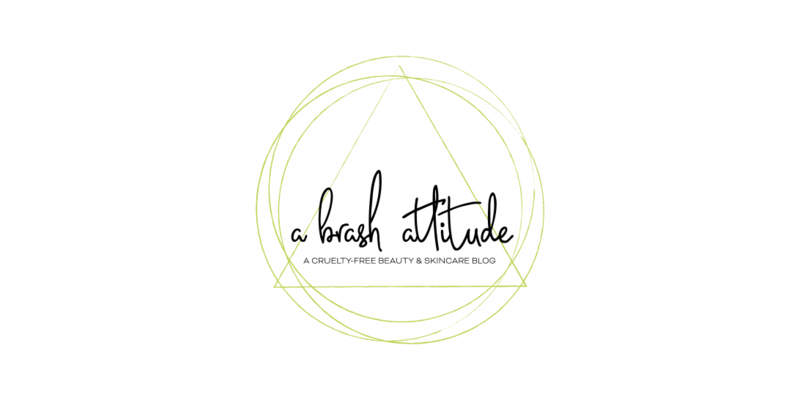 The original review is here in my March Empties post. Oz Naturals, Hyaluronic Acid Facial Serum – I’ve gone through several of these serums since my first purchase. Love this stuff. I’m currently testing out some other products right now, but will likely re-purchase this at some point as it works so well with my finicky skin. The original review is here. Naruko, Rose & Botanic HA Aqua Cubic Night Gelly EX – this stuff is so amazing. I love the rose scent (true rose, not cloying synthetic rose scent). It made my skin so soft, smooth and glowing. I’m currently testing out some other products right now, but will likely purchase this at some point as it works so well with my skin. The original review is here. Oz Naturals, Vitamin C Facial Cleanser – I liked this cleanser more than the Ocean Minerals one. It worked well for my sensitive skin. I might repurchase at some point, but I’m testing out some new things right now. The original review is here. Both liquid liners are from Essence. I didn’t use them very often and the pen dried out, and the wand got clumpy – both from lack of use. Despite having a big love for Essence, I won’t be repurchasing either of these liners. The original reviews are here. Disclosure: Please see original reviews for individual product disclosures. Since people seemed to like my swatching singles posts, I thought that I would continue with the theme and swatch all of my eyeliners for you. I’d gotten rid of a lot of old ones at some point last year, so my collection is fairly small. I have several from Urban Decay, one from Tarte, one from Kat Von D, and an ancient one from Stila. Here’s the one’s from Urban Decay: from left to right perversion (the blackest matte black), zero (black), smokeout (more of a dark brown), psychedelic sister (awesome purple) and goldmine (gold). Out of these ones, I use perversion, zero and smokeout the most. I sometimes use psychedelic sister, and rarely ever use goldmine. These two I had completely forgotten that I owned – the first one is from Tarte, I think that this one came in a 500 points gift from Sephora ages ago. The other one is from Stila, and is ANCIENT. I don’t even think that this product still exists, but it continues to be smooth and creamy, so I’ll probably keep it a little longer. Up next are the only two liquid liners in my collection. The first one, is a mini that I’d gotten in my giveaway winnings from Hello Kaily last year. This was another one that had gotten lost in my makeup trays, so I think that this is the first (maybe second) time I’ve ever opened it. I’ll probably try using it later this week. The second one is from Essence, and it has thickened up, so I’ll be putting it in my April empties post before trashing it. So there you have it, all of the eyeliners in my make-up stash. Do you have a lot of eyeliners? Or do you just have “the one”? Disclosure: None of these things were given to me by companies. I either purchased them myself, or got them as point perks from Sephora ,or won in a personal blog giveaway. A radiant eye liner that also doubles as an eye shadow. Made with a blend of mineral oil and powder our creamy Jumbo Eye Pencils glide on effortlessly—no pulling tugging or fading—and come in a rainbow of vivid hues. Our most voluptuous pencil yet! I had high hopes for this eye pencil since it can be used as either a liner or as a shadow. Rocky Mountain Green is described as being a true green. In the packaging, it looks like a bright emerald green with a bit of a metallic finish. Here it is swatched directly onto the skin, no primer. 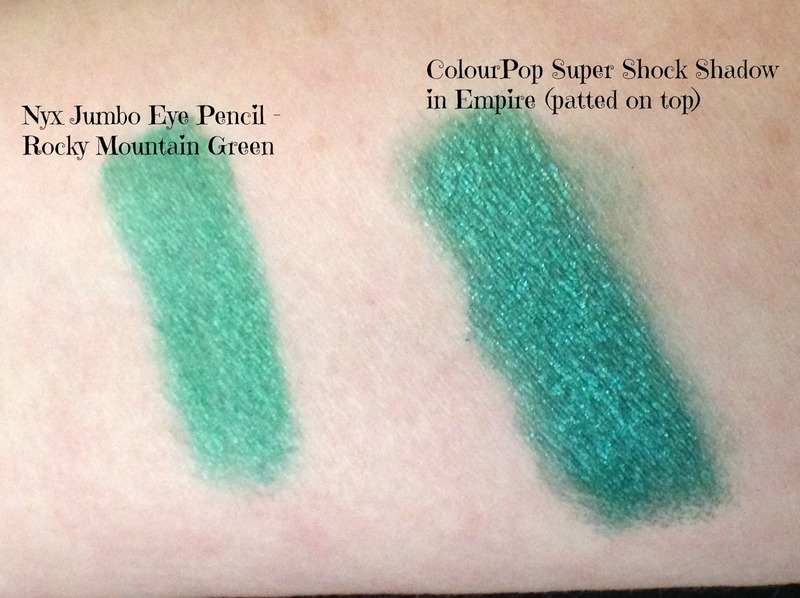 I was expecting a more rich, jewel-toned, slightly metallic, emerald colour. The colour isn’t bad, it just isn’t as intense, or pigmented as I was hoping for. But all is not lost! 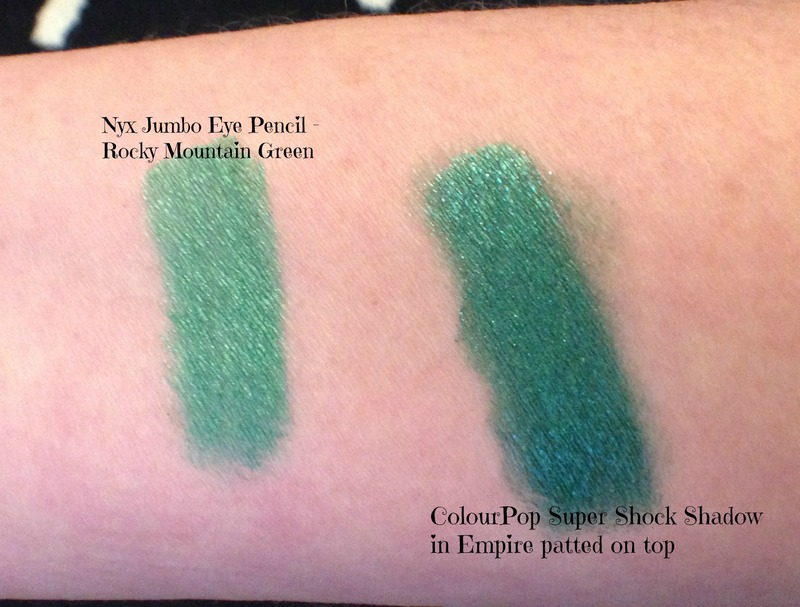 I can use it as a primer of sorts for my ColourPop Super Shock Shadow in Empire. They work amazingly well together! I will probably pick up a few more to try out since it worked so well to keep my shadow locked into place. I just returned to using liquid eyeliner recently after a loooooooong hiatus. I picked up two different types of liquid eyeliners by Essence Cosmetics a couple of months ago at the local Pharmaprix (Shopper’s Drug Mart, for those of you fellow Canadians that aren’t living in Quebec). The first one is the Super Fine Eyeliner Pen. Oh so fine! This super fine eyeliner pen has an ultra slim felt tip applicator for precise application. Long lasting formula. Ideal for creating fine and subtle lines or extravagant and dramatic ones. I found this to be a little difficult to achieve a consistently sized line, and found that I had to go over the lines to get an even application of the liner. This might be due to being out of practise in applying a liquid eyeliner, or it might be the pen tip itself. I found that it wasn’t a true, deep, dark, black colour. And, once dried on the skin, it keeps a tacky finish. Rubbing the swatch led to some colour transfer. Would I buy this one again? NO. The second liquid eyeliner is the Essence Liquid Eyeliner. This one has a wand style applicator, which is more like the old style ones that I had used in the past, except that instead of a brush at the end of the wand, it is a firm, brush shaped, foam tip. Intense definition! 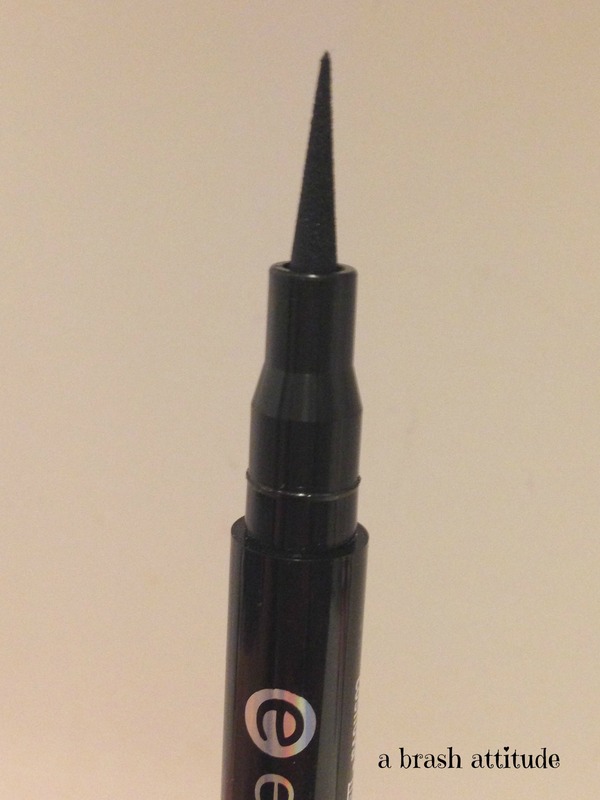 This liquid eyeliner provides fast-drying and long-lasting results. Available in classic or waterproof. I found this one to be a lot easier to apply, likely due to having used the wand type liquid eyeliners before. The eyeliner seemed to be much easier to control the thickness of the line, and applied the eyeliner evenly, so I did not need to go over any spots. As well, the colour is a true, deep, dark, black. Once dried on the skin, it is not sticky to the touch. Rubbing the swatch did not lead to any colour transfer. Would I buy this one again? YES! In North America, you can find Essence Cosmetics at Ulta, and here in Canada at Pharmaprix / Shoppers Drug Mart, both eyeliners sell for $2.99 USD (and for a comparable price here in Canada). Disclosure – Both products were purchased by me!